If you were here back then, you remember it. The weather forecasters were still saying 2-3 inches at about the time you could go outside and see there was already 8-9 and scratch your head in confusion about what the forecasters were smoking. Over 20 inches in spots by the time it ended. I had turned 13 a little over a week before. It’s snowing outside right now. I doubt it will approach 20 inches. They’re only predicting 8. But they were only predicting 2-3 that night 26 years ago. Considerable falling and/or b>lowing snow that reduces visibility frequently to less than 1/4 mile. The second of those two requirements happened. The first one did not. It was just a snowstorm. This entry was posted in Uncategorized on January 31, 2008 by John. It also made me think about a small land known as Enfrac that only I and a handful of other St. Louisans know about, but hopefully someday more people will know about and love.Â I need to work on that. I may have a snowday tomorrow…so I will have some time to spend. I need to hear from all of Camelot! I think we need to hear from the Shrivers.Â Who are the Shrivers supporting? I can’t make up my mind until I know how all the Kennedy Clan are swinging, and just because they’re descended from Eunice, Jack and Bobby’s sister, doesn’t make then any less important. This entry was posted in Uncategorized on January 29, 2008 by John. ReadWritePoem is prompting poems that incorporate mathematics.Â The Velveteen Rabbi wrote a poem about Gematria. Here’s a poem I wrote awhile back, but I haven’t had much luck submitting it places.Â I think because it is a little bit strange. So your lack of comprehension of the above poem is roughly equivalent to the loss of soda in the can. More mathematical poems submitted for the ReadWritePoem prompt can be read here. Cory Doctorow at BoingBoing has just discovered the card game, Fluxx.Â It is as insanely fun as Cory says it sounds.Â I’ve been playing it with some friends for over a year now.Â It’s a rare feeling to know about something this long before it hits the geek sites. You can find Fluxx locally at GamerGround. Personally, my favorite version is Zombie Fluxx. I agree with Christopher Moore’s comments on his MySpace. Is it an Unidentified Martian Object – or an Identified Martian Object? There actually seems to be some agreement that it is an IMO. 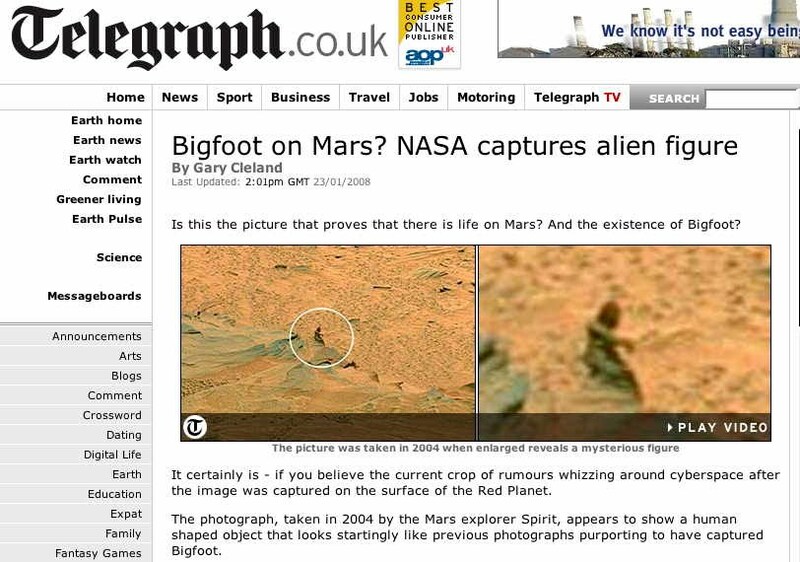 It’s just that NASA identifies it as a Rock.Â And a few other people are identifying it as Bigfoot. This entry was posted in Uncategorized on January 23, 2008 by John. You look like an idiot when you confuse the two. I really wanted to laugh at the below video, and was laughing, until the misspelled caption. Then I was just disgusted with the poor US educational system. Go ahead, call me a spelling Nazi, but at least I’m not a Cowboys fan. This entry was posted in Uncategorized on January 21, 2008 by John. Media: Romney keeps campaign alive with first win of his campaign (most news sources are awake enough to actually state “first primary win”, which is technically correct, but suggests Wyoming’s status as a caucus makes it irrelevant, even though Iowa’s caucus certainly wasn’t irrelevant. A conundrum. I bet many residents of the state of Wyoming are developing a hatred for the national media by now, as they jump up and down waving their hands in the air “Look over here! We exist!) Romney has also, apparently, made a stunning comeback, and has “tied” up the GOP race. Please don’t ask me about the numerological significance of this. I don’t wish to ponder it. This entry was posted in Uncategorized on January 16, 2008 by John. This entry was posted in Uncategorized on January 15, 2008 by John.